The Browning Wihongi Signature Kukri is a fixed blade knife for your collection of uniquely designed blades. 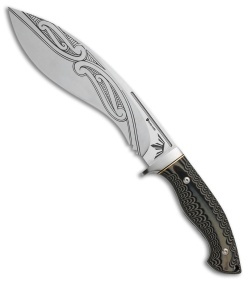 8Cr14MoV stainless steel, kukri blade has a satin finish with Maori warrior tribal motif artwork. Gray G-10 handle over a full tang construction that includes a lanyard hole.